In 1848 there was the California Gold Rush. Nearly three hundred thousand would-be prospectors made their way west in the hopes of making new lives for themselves and finding prosperity. This sort of behavior has repeated itself many times both before and after that event; human beings are always looking for a way to become wealthy, and a sort of feverish mania tends to surround any “new” prospect. One could easily argue that this mania is exactly what led to Bitcoin’s meteoric rise and fall over the course of late 2017 and early 2018. Instead of being interested in the technology, people were more interested in getting rich quick; naturally, as with any commodity where the price goes vertical, this couldn’t last forever. Of course, this says nothing about the long term prospects of Bitcoin — only that it’s undeniable at this point that there was a sort of “Bitcoin mania” going on. Yes, this was a real headline. If your iced tea company is throwing “blockchain” in the name, it’s a pretty clear sign that you’re probably in this for a quick cash grab even if you claim to want to focus on ”the exploration of and investment in opportunities that leverage the benefits of blockchain technology.” Likewise, as I’ve previously written, there are plenty of other “blockchain” companies, like Longfin which might seem to be legitimate at first glance but are really the most abject sort of dumpster fires you could imagine. If the companies are usually sketchy, why not just buy crypto? Technical complications. Let’s face it: understanding how to use cryptocurrency still has a learning curve, and many people would rather not spend time learning this new skill. If you’ve already got a brokerage account, you can easily purchase a blockchain ETF like BLOK, BLCN, LEGR, or KOIN and get a relatively accurate Bitcoin trading experience. Different risk profile. While an ETF (“exchange-traded fund”) is usually meant to correlate to a particular commodity such as gold or Bitcoin, it will never be 1:1 and it could even be way off. Furthermore, if you invest into a particular blockchain company, you’re dealing with an entirely different animal. While the market capitalization of cryptocurrencies is the wind that pushes their sails, an individual company could succeed or fail on other merits as well. Options trading, margin trading, etc. While Bitmex provides the ability to do all sorts of wacky things — even 100x leverage, if you’re completely out of your mind — it’s not open to many countries including the USA. This isn’t a problem if you’re trading an ETF associated with Bitcoin or a company which is focused on blockchain technology. You could buy calls on Riot today if you wanted to! Peace of mind. This one is a bit subjective. Personally, I am a strong believer in Bitcoin’s security — the only way you can lose your coins is if you make a mistake. However, it’s undeniable that there’s a lot more public faith in existing institutions. For better or for worse, people are more trusting of the stock market than cryptographic security. Of course, based on my experience with Longfin, I’m inclined to believe the opposite! Anyone who lived through the financial crisis of 2008 is well aware that the SEC, Nasdaq, the rating agencies, and basically the entire industry is chock-full of crooks. Of course, for every reason I’m listing that you might want to buy a blockchain-based stock, there are just as many good reasons to buy cryptocurrency itself. As cut and dry as it might seem at first glance, the reality is that there are legitimate reasons to get involved with both types of trading. RIOT Blockchain: Best Of Breed? 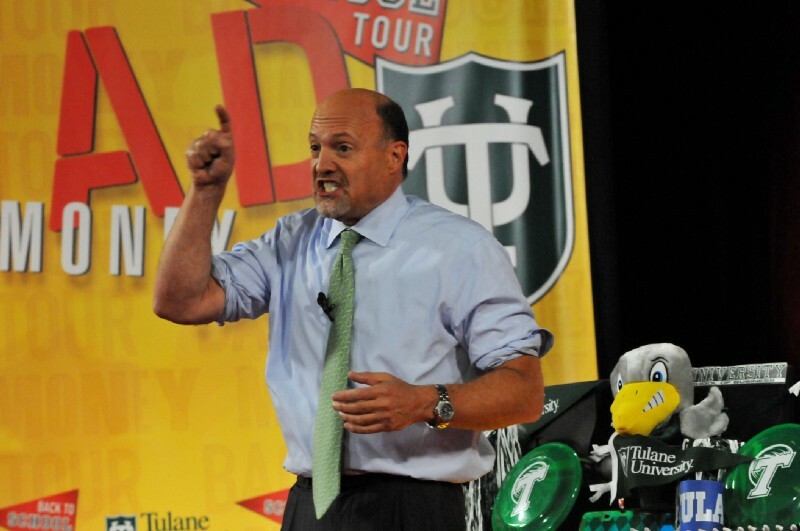 Jim Cramer advising you to buy Bear Stearns in 2008. Just kidding. So, is Riot Blockchain the “best of breed” when it comes to Bitcoin-related stocks? I don’t know, but I do think that they are very promising in spite of the fact that they jumped on board the blockchain hype train in what appeared — at first! — to be a cash grab. Riot Blockchain used to be a penny stock and a biotech company called Bioptix Inc. When they changed their name and focus, their share price skyrocketed, eventually reaching almost $30 per share. This is, as I’ve mentioned, a pretty obvious sign of price mania, and at the time it was fairly obvious that it wouldn’t last. Indeed, like with most cryptocurrency-related things, the price is quite depressed (around $6.5 at the time of this writing) compared to then. However, there is a difference between a company like Riot and an iced tea company that adds the word blockchain to its name. What is that difference? It’s simple: unlike many companies, Riot appears to be very serious about its pivot into blockchain technology. Mining operations. Riot Blockchain is very serious about mining, to the extent that they currently have about eight thousand ASIC miners. While they’re still in the process of fully deploying all of this, they will eventually achieve 110 petahashes per second. This is an incredible amount of hashing power! Back in May they reported mining 122 bitcoins, including the Bitcoin Cash which they converted into bitcoins. That’s around a million dollars going by May prices — not bad! Blockchain-related investments. Riot is serious about investing in or acquiring various cutting-edge blockchain companies and projects. Some examples of these projects are Coinsquare (a Canadian Bitcoin exchange), Tesspay (a blockchain-based escrow service for telecom carriers), and Verady (a “blockchain asset assurance” service which is providing badly-needed accounting and audit technology). These sorts of investment mean that Riot’s profitability is not as married to the price of Bitcoin as one might think; they’re not just mining. If even one of these projects takes off, we are likely to see quite a jump in Riot’s share price. What about the SEC investigation? “The Company has received and responded to comments from the staff of the SEC regarding certain developments and the Company’s ongoing development of a blockchain/cryptocurrency business model. These inquires include the proper asset classification, applicability of the Investment Company Act [of] 1940, to the Company’s business and affairs and accounting treatment of its cryptocurrency,” according to the quarterly report. Just yesterday, more news arrived which adds heavily to Riot’s legitimacy: the company is now joining the Russell Microcap Index. An “index” is something which measures the performance of various segments of equity markets and are essentially made up of many stocks which share certain attributes. In this case, the common denominator is that all of the stocks in this particular index are “microcap” stocks, i.e., they have small market capitalizations. This is a mouthful, but the long story short is this: getting onto the FTSE Russell indexes usually doesn’t happen to sketchy stocks, and if it does, they get thrown off very quickly just as Longfin did. The fact that Riot was indexed is very good news; I believe this vindicates them as far as the SEC investigation fears go and implies smooth sailing for the near future — or, at least, as smooth of sailing as is possible when you’re in the rough waters of the cryptocurrency world. Still, I strongly believe that Riot Blockchain is a promising crypto stock — perhaps the most promising one out there. The takeaway is this: do your research and make your own decision, but I strongly believe that Riot is a good investment for those interested in investing in crypto without going through the trouble of buying the actual currency.